Gomez, 26, appeared front and centre Thursday night in several videos and pics during Raquelle Steven‘s Birthday Bash. 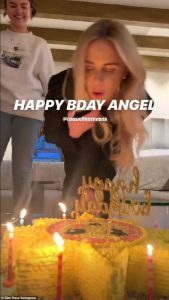 Keeping it casual, Singer Gomez wore a grey sweatshirt, light blue jeans and white boots as she sung “Happy Birthday” to her longtime friend. She’s all smiles as she wears her hair up in a ponytail and rocks hoop earrings. 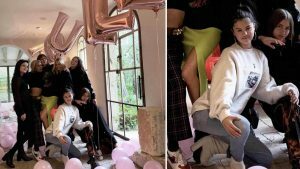 The “I Can’t Get Enough” singer celebrates an epic birthday party for her friend Raquelle Stevens. The house is filled with pink balloons, a sun-shaped cake and even an adorable tiny puppy. Posing along with the other party guests, Gomez seemed happy and in her element next to the birthday girl while she blew out her candles on her sunshine cake. The girls did a great job of decorating too. Stevens share a photo to Instagram of herself with Gomez, Simi Khadra, Haze Khadra, Ashley Cook, Zahra Ayub and Caroline Franklin. 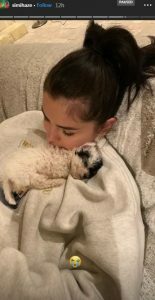 Khadra also took to her Instagram Story to share a cute snap of Gomez cuddling up with a small pup. The singer was later photographed completely melting over a tiny puppy while it laid on her chest. 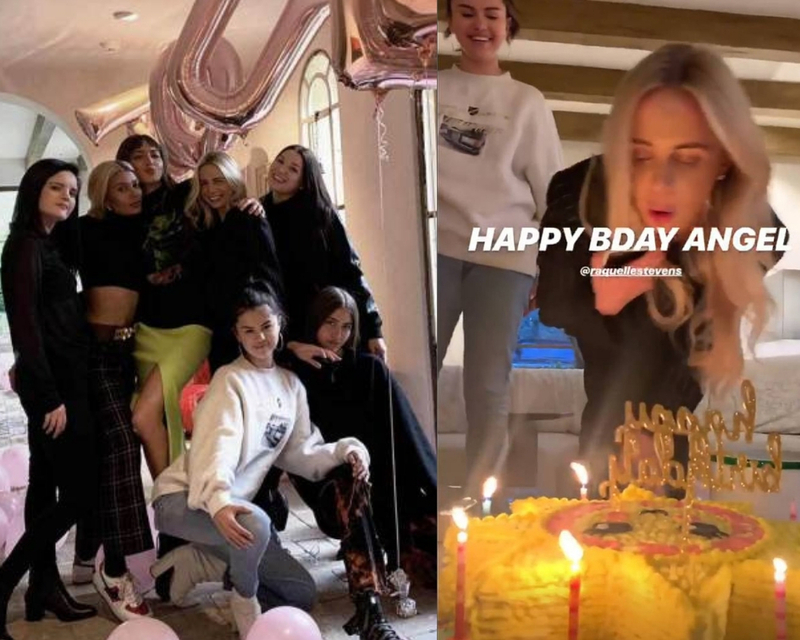 Selena Gomez, 26, along with the help of some friends, surprised BFF Raquelle Stevens with a very pink party for her 27th birthday on March 21. 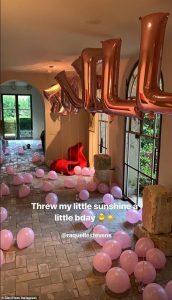 Dozens of pink balloons lined the floor of a large house, and rose gold inflatable letters spelt out “Raquelle” among the décor. 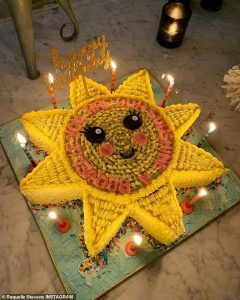 The birthday girl was especially impressed with her cake, which was a gigantic, smiley sun. Selena turned up to the birthday bash in a comfy sweater and stylish white boots and posed for a round of photos with friends. “Best friends in the world 💞 thank you for throwing me such a beautiful party!” Raquelle captioned one of the group shots, which she shared to her Instagram the following day. Standing alongside Raquelle and Selena in the photo. Below were friends Ashley Cook, Zahra Ayub, Caro Franklin and the DJ sister duo Simi and Haze Khadra (AKA, SimiHaze). Of the lot, Raquelle and Ashley are the “Wolves” singer’s longtime confidantes. The trio, along with best friend No. 4 Courtney Lopez, all got matching “4” tattoos in Aug. 2018. “#4 because these women have stayed by my side for 7 years (@ashley_cook 12 years) 4. Because you are my 4 for the rest of my life. I love you ladies. You all inspire me to be better, stronger, closer to god. We have lived the most INSANE story together already. Can’t wait for 50 more,”. Selena captioned a slideshow of the group’s trip to the tattoo parlour and also joked that Raquelle had “an actual panic attack. 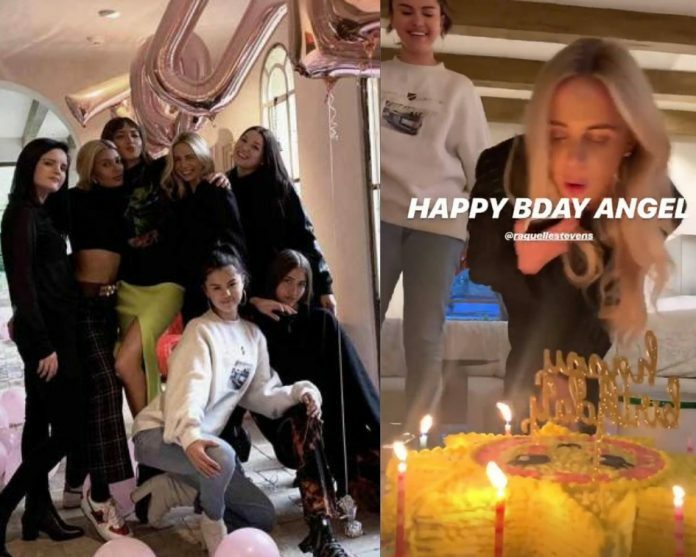 The party’s guest of honour often features Selena on her Instagram feed. They dressed up in an Instagram photo on Feb. 22, did a photo shoot for Puma X SG together that was shared in Nov. 2018, and more. The pop star is known for staying in touch with old pals. On March 11, Selena even reminisced with Miley Cyrus on their performance of the Hannah Montana star’s breakup anthem, “7 Things,” at the 2008 Teen Choice Awards. “Tbt – such babies,” Selena commented underneath the nostalgic video, and even fellow Disney Channel alum Demi Lovato chimed in. On 23 March, Selena also celebrated National Puppy Day early, as the actual holiday on Saturday. She cuddled with a sleepy pooch at Raquelle’s birthday bash.